The recitation of these letters is a unique feature of the format, and ignites the curiosity of anybody who is learned in the Arabic language. Scholars of the Quran have said that whenever a Surah begins this way, the next verse is always about some special, miraculous aspect of the Quran. On the contrary, some ignorant people have said that some parts of the Quran do not mean anything; thus committing a huge mistake. Coming towards the linguistic aspect, if we remove the repetitive letters, then the numbers of letters come down to fourteen, half the number of the letters in the Arabic alphabet. Alif, Lam, Mim, Sad, Ra, Kaf, Ha, Ya, `Ayn, Ta, Sin, Ha, Qaf, Nun. Those who are well-versed in the Arabic language will know that Arabic is a language of patterns, and most of the words used in speech comprise of one, two, three, four, or five letters! I remember once during tajweed class, the professor was explaining the elongation (مد) of these separated letters. She explained that a native speaker of the Arabic language will not recite these letters except that he will feel the miracle of the Quran. Indeed, alif, laam, meem are the letters that make up the Quran, and these are the letters he uses to speak to his own kind, but he will never be able to produce something like the Book of Allah. The verse continues to highlight a unique aspect of the Quran: (These are the verses of the clear Book) i.e. 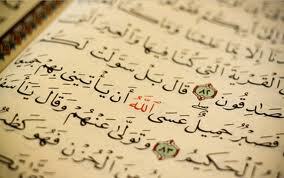 the Quran; which is plain and apparent and makes known the unclear matters. Allah s.w.t then tells us about the wisdom behind revealing the Quran in Arabic: so that we may understand, because Arabic IS the most eloquent of languages. Therefore, the most honorable Book was revealed in the most honorable language to the most honorable Prophet by the most honorable angel in the most honorable land on Earth during the most honorable month of the year, making the Quran perfect in every single aspect! Taking a closer at the ayah, Allah s.w.t says أنزلناه which is derived from the word إنزال and in other ayat of the Quran, Allah s.w.t says تنزيل. Both these words: إنزال and تنزيل mean “to send something down”, however, there is a slight change in meaning due to the change in pattern. إنزال is to send something down all at once, while تنزيل means to send something down little by little. Both these words are used to describe the revelation of the Quran. In this ayah of Surah Yusuf, however, إنزال is used, and that is an indication that the Surah was revealed all in one go. Ibn Jarir recorded that Abdullah bin Abbas said, “They said, O Allah’s Messenger! Why not narrate to us stories about nations that have passed?” Later on, this Ayah was revealed. Allah s.w.t is telling us here in the present tense form (We are relating to you, narrating to you, telling you…) that this is the best of stories! What more do we need to understand that the Quran is sufficient for us? Indeed in their stories, there is a lesson for men of understanding. It is not a forged statement but a confirmation of Allah’s Book and a detailed explanation of everything and a guide and a Mercy for the people who believe. And so, unlike any other story in the world, the stories of the Quran contain valuable lessons from our Creator. For men of understanding and for those who wish to analyze, to open their eyes, there is a profound realization in these stories. There is guidance, enlightenment, an invitation to Allah s.w.t’s Mercy, and a warning from His Wrath. The next post will be about Yusuf ‘alayhissalam’s dream and Ya’qub ‘alayhissalam’s response inshaAllah. Stay tuned!